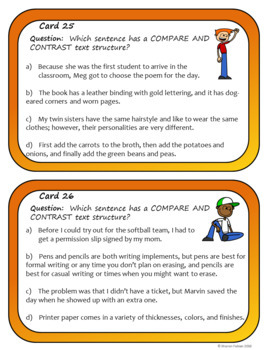 With this set of Compare and Contrast Task Cards, students learn to really understand the text structure of compare and contrast. There are thirty large cards with a variety of activities for plenty of practice on this essential reading comprehension skill. 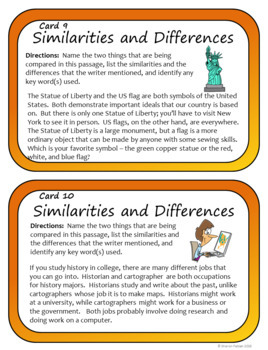 These task cards support the Common Core standards for reading informational text, identifying text structures, using text-based evidence, and reading proficiently with understanding. With thirty cards including a variety of activities, they should work well with kids at a range of ability and skill levels. 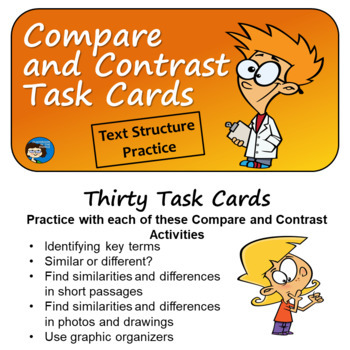 This set of task cards is designed with content and graphics for middle school and upper elementary students. For more reading task cards, including sets for each story element, see: Task Cards. 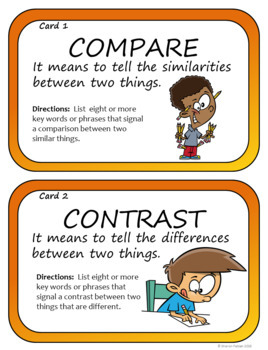 This set of task cards is also available packaged with a Compare and Contrast Slide Presentation.